Francis has lived in the Kimana corridor of Kenya all his life, and passed well through his primary and secondary schooling to become a well known local politician. Francis lost an older brother to tuberculosis several years ago, and became responsible for his brother’s children Ntimama (age 10) and Babu (age 3). He quickly realized the burden of inheriting several children to care for, particularly amidst raising his own, and since then has sought out other families with similar situations. Since 2009, Francis has identified over 33 orphaned children who are receiving little to no care. Francis visits the orphans regularly, brings them food provisions monthly, and cooridantes with local schools to pay school fees. Without Francis, this program would not be possible. 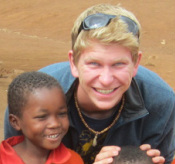 Seth first travelled to Kenya in 2010 as a student with the School for Field Studies. After meeting and working with Francis he decided to support Francis' dream of caring for many orphaned Maasai children. Through fundrasing and the support of friends and family Seth was able to register the Amboseli Orphans Project in Kenya and the United States as a non-profit organization. Seth returned to Kenya in 2011 to administer raised funds, and was happy to see the first orphans enrolled in school and realized the project to be well regarded and accepted by the community. Seth currently studies Environmental Science and Recreation at Western Washington University. To learn more about Seth's travels in Africa visit blog.amboseliorphans.org to read more! Naomi has also lived in the Kimana area her entire life. Naomi met Francis while they were in primary school, and they have been married for several years now. Naomi is a well known and respected in the Kimana community, and is known affectionately as "Mama" by many children whom are not her own. Naomi works to coordinate community meetings between the caretakers of orphans in the project, and frequently visits many of the children to check in with them. Coming Soon... Meet the children and families supported by this project!